Pulp Strategy launched Trails of India – an exclusive social and lifestyle product on Mobile and web platforms that connect passionate bikers across the country to share fascinating riding stories create detailed mapped trails of motorcycle travels and share information on the go that makes motorcycling more fun and inspiring. The Trails of India is the product for getting social with everything motorcycling. It seeks to redefine the riding experience with ardent bikers from all over the country as its members. Bikers from all over India can use this platform to share enticing biker stories, journeys, experiences, and get the latest updates from the motorcycling world, including aftermarket inclusions, technology from across the world for the bike and the rider, safety gear, gadgets and more. Bikers can create online groups to create their exclusive space for offline groups, post events, get invites and information to the rides and events across the country and also Riders can also post queries in the forum section to get relevant answers from a team of experts and other seasoned bikers. Then next time you take out your big bike and plan a ride to an exotic far flung road less traveled chances are you can get authentic information from another bikers experience on the route, pits tops, fuel quality best stop overs parking friendly rode side joints and hotels, on pot holes, local flavors and the roads to bypass. The Trails of India celebrates biking and also celebrates travel on two wheels in Incredible India. It is an initiative to strengthen the bond within the biking brotherhood and bring the biker community closer while inspiring fellow bikers to travel the roads unmarked in our amazing country. Trails of India also has a unique method of recognizing passionate bikers with 4 levels where you start up as a Road Scout and as you share information with the fraternity you can work your way up to a trailblazer. There are exclusive patches and goodies to earn along the way. Ambika Sharma Founder of Pulp Strategy and an ardent biker commented on the launch “This was a product we have really enjoyed bringing alive, it is truly for the bikers by the bikers, travel on big bikes is a passion fast catching up, bikers are travelling across the country in increasingly large numbers, usually when we ride to a new location we check with fellow bikers on facebook, whatsapp etc to get information on the route and other details, information is valuable but the base is fragmented. Bikers are willing to share info and experience with others but unfortunately your query may not reach the correct person. 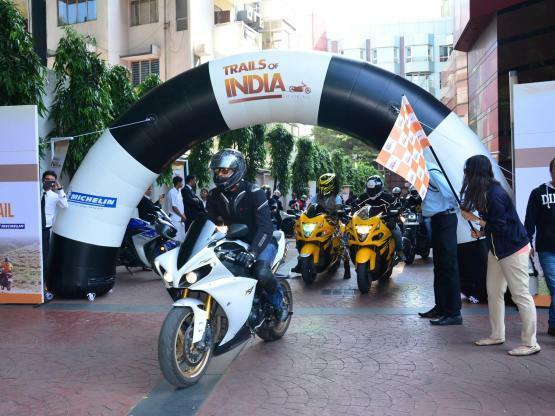 Trails of India provides information and most importantly passionate bikers on an all India platform”. The App is available on The play store for Android users and on the App Store for iOS while the web version can be accessed on Trailsofindia.com previous ride experiences or fresh plans to can be chronicled on-the-go through a mobile phones and the Trails of India app which also has provisions for tracking live-trails via checkpoints and pit-stops. Currently, there are over 20 unique interesting trails featured in the trails section. A number of big bike groups are already on board and have shared their experiences.